Published on June 3, 2010 in General T&T, Parliament, PNM and Politics. 13 Comments Tags: Keith Rowley, Patrick Manning, Pennelope Beckles, Politics, The Opposition. AS the People’s National Movement (PNM) prepares for its new role as this country’s parliamentary opposition, there appears to be growing support for former Arima MP Pennelope Beckles to be appointed as Leader of Opposition Business in the Senate and to succeed Patrick Manning as PNM political leader. Beckles, former attorney general Bridgid Annisette-George, former ministers Fitzgerald Hinds, Anthony Roberts, Christine Sahadeo and attorney Faris Al-Rawi are reportedly among the names being considered by Opposition Leader-designate Dr Keith Rowley to be Opposition senators in the Tenth Parliament which is expected to convene on June 14. Al Rawi is the son of former PNM San Fernando West MP Diane Seukeran. Under Section 40 (b) of the Constitution, the President appoints six senators on the advice of the Opposition Leader. PNM chairman Conrad Enill told Newsday Rowley “has been in consultation” with his 11 colleagues in the House of Representatives (including Manning) and other persons in the party on the selection of the best Opposition senatorial team. Rowley said he would announce the names of the six senators after he received his instrument of appointment as Opposition Leader from President George Maxwell Richards. That event takes place at Knowsley, Port-of-Spain tomorrow at 4 pm. This is wildly expected.I also agree with Sahadeo and Al Waris.PNM has always been a party of inclusion,unlike the others which only include for convienience. Mrs Beckles is a most worthy candidate for a senatorial post. Listen to this guy call T-Man folks. If a poll is conducted on this here bloggersphere,without question Ms. L would win it hands down as perhaps the most balance , and objective around, but yet, he thinks she would come today and make up a story to bolster her point on confuse elites of our Trini Indo community’s behaviors when in power. At the same time this tribalist would turn around and try to convince us that since he and his clans 1986 escaped to Canada, every trade delegation that came to that country was of African descent. Please ,all this nonsense about African Equality Congress,save it, as such only plays into the racist hands of Sat , Goopesingh , and AG Ramlogan or whatever is his name. Can someone remind these devide and rule club about the evils of ingratitude. So ‘Ms Divider,’ keep these grandstanding, feel good Dagga CARICOM Ambassador offers, why is he not busy moving into our neighborhoods to encourage kids to stay in school and be all they can be is beyond me. Mark as House Speaker ,to ensure that MP’s turn off their laptops , and such useless operations, get’s us no way, but that’s your right. However, land reform , and redistribution ,as a priority ,so that the folks in the PNM Brazilian Favelas, and yes, UNC created Mumbai/ Meerut like Slums, can finally be empowered. Let me hear of a massive pro entrepreneurial ,re education drive across the nation so that folks that were traditionally left out of business – for obvious reasons- would finally be given opportunities aimed at elevation, and non lifetime dependence. Many decent citizens wish to create, and help strengthen our ignored , over -politicized Civil Society,as such would ensure that ‘Human Security,’ is more than a catch word for Foreign Minister Suraj Rambachan ,as he runs to the UN in efforts to vote yes and no to empty unenforcible treaties. I am talking about micro financing for poor women, protection of abused women and children,meaningful ,community health projects , and pro youth programs to keep our kids focused on education, via the information Highway. Madame K and your crew, the ball is in your court, please spare me the lamentations about Manning ,and his old school PNM,just like you are doing quite splendidly I might add,re Panday and your old UNC. That’s changes we can believe in, and rest assured that we would in turn show gratitude come 2014. Don’t worry T-Man , I have the data to show what can transpire for collective people who ignore history’s lessons ,but instead allow arrogance, selfishness , and evil tribalist predilections to dominate the psyche, using Massa England,well tried and perfected political play books methodology. Love country , over tribe, my friends. look at this filthy post that does not relate to the topic. I am convinced that some of our non-resident, now American dual citizens are living in such a racially charged environment in the USA that they are transferring their overly sensitive racial conflict and paranoia to T&T relations and viewing everything through filters of race and colour. Times are changing and the truisms which existed in the minds of the lost generation to which they belong have been debunked. When did time change T-Man ,was it on March 24th 2010? The fans of one much adore American. President ,naively thought that they were suddenly transformed into a postracial world,untill reality struck. I see the national hatemonger just slittered out of his zandole hole,and is demanding another useless Ministry to deal with Multiculturalism,’ of all things. How laughable indeed to think we need a new department to tell us how to treat each other with respect,and dignity. While we are at it,let’s make 50 more racially charged holidays,and change the names of 100 more awards, and 1000 streets. “This is change” Canadian style we can believe in. What is it,1650 or less days before this comical charade is through? The recently transfered Consul General t Miami, Mr. F. who was posted to Latin America, was of African descent with an Indo-trini wife. I thought that made him specially qualified for the post. I wonder if any such people would be posted anywhere in the future. We have to wait and see nuh? My experience, including my own family’s history tells e that Afro-trinis push multiculturalism and diersity, others do not. When I did consulting work with oil ompanies coming to TnT, I always encourages ythe wives coming to invest in a sari, and an Africn outfit while in Houston, because dressing in the clothes of the people on special occasions, was a nice touch.As I said before, this is my land, dual citizenship gives me some advantages, BUT TRINIDAD IS MINE. MY FAMILY HAS BEEN HERE SINCE 1815, AS FREE PEOPLE. Incidentally, when my father worked at Waller Field on the American base in the 1940’s he used to sign for the paycheck for a certain Badase Sagan Maharaj, who was an illiterate grass cutter. We never saw race, just fellow human being. I did not believe that he really was illiterate until much later, when he got into politics.It was the same with Mr. Wagid Ali helping us find a place for religious instruction on his compound, although he was a devout Muslim.Lazeena, his daughter, was my friend. If you grow up multicultural, as I did, in a family that included all major races except the Chinese, it stays with you. This is why it must be a factor in schools. Later, is too late. I am not in a contest with anyone though, these snippets from my experiences are things the newer generations know nothing about, a pity. If you read Sat’s article you would see that his idea of ‘multiculturalism’ is the distribution of money to the various races, religious bodies and organizations. Sat’s version does not have the naturality of people interacting with each other and just ‘growing up’. All he cares for is ‘gimme the money’ then lets separate. Somebody should ask the said Sat if he ever probated his father-in-law’s will, or did he think tat because they had the same name, it would all devolve to him.. That might shut him up for a bit, just a bit. Off topic, but speks to the characyer of this devotee of religious righteousness. I place Sat in the Hindu fanatic category. He is conveniently invoking Canadian multiculturalism to rationalize his narrow vision. He should realize that Hindus comprise approximately 32% (correct me if I am wrong) of the population of T&T and that is by no means the majority he frequently invokes.From his article recently, it is clear that he does not understand anything about the nature or functioning of the Canadian Multicultural program. He should read a book entitled SELLING ILLUSIONS, the cult of multiculturalism in Canada, written by a former TRINI, Neil Bissondath, the nephew of Vidya Naipaul. The Canadian program was designed to cater to the influx of immigrants from all over the world.It is based on the initial preservation of cultures and religion, with a goal of integration.Although it began as a funding mechanism for minorities, it progressed as mainly to a support system to encourage cultural festivals, and national participation and interest in all cultures. In the words of Neil Bissondath, “Multiculturalism, with all of its festivals and its celebrations,has done and can do nothing to foster a factual and clear-minded vision of our neighbors. Depending on stereotype, ensuring that ethnic groups will preserve their version of their distinctiveness in a gentle and insidious form of cultural apartheid, multiculturalism has done little more than lead an already divided country down the path to further social divisiveness”. We need experienced PNM people in the senate,people ho have the interest of the country at heart, and have demonstrated this. We need women there, but we must avoid the tendency to match woman leader with woman leader, as the opposition did in the Williams government when they persuded Dr. Rudranath Capildeo to be leader of the DLP party. This was just to have a PhD in their court also. He was a scholarly man, great mathmatician, who should have stayed in academia.I saw him once in a “private moment” sitting at the airport waiting on some big wig to come in. He was alone, his face suffused with sadness. I felt sorry for him he looked like a fish out of water. He died early. Had he stayed with Vector Mechanics and other aspects of his brilliant work, he might have lived much longer.Politics is not everyone’s cup of tea. Good followers and idea people, are not necessarily good leaders. If we aim to emerge as a regional leader, that intends to make sustainable development, sound democracy ,and good governance,more than mere white paper, fancy talking points, then it is important that a viable and strong Opposition emerge,and show what a ‘government in waiting’ truly means. As long as the national interest remains paramount at all times, I am sure that our country would do well. Obviously,the government has a major role to play in the process , but so is the Opposition, often ignored Civil Society , our highly skeptical private sector,and thousand of regular, overly expectant, and overwhelmed folks, that voted on May 24th, and would be on line to possibly exercise that right, four years hence. Let’s wish our county well. Analyst: Does Penny want to lead PNM? 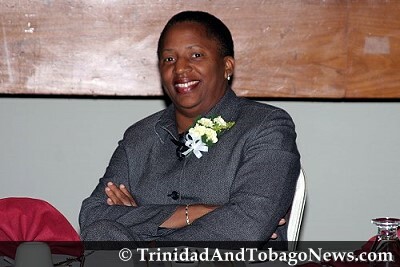 Whether PNM supporters want former Deputy Speaker of the House of Representatives and former Arima MP, Penelope Beckles as a female political leader is not the critical factor in the life of the party at this time, political scientist Dr Bishnu Ragoonath believes. Ragoonath made the comment responding to whether the PNM wants a woman leader, akin to UNC leader and Prime Minister Kamla Persad-Bissessar. He said it first needs to be established whether Beckles, who was sidelined on two occasions by the PNM in her candidacy quest in the recent general election, wants to be party leader. “Nobody has yet been able to confirm whether Penny wants to be PNM leader,” Ragoonath said.